The last full day. The last day of true safety. After my sleep-deprived-and-zombified antics of the night prior, I woke feeling incredibly refreshed. I all but hopped out of bed with my alarm. I showered and dressed with a light heart before waking a considerably crankier Pat, because he's always cranky when you first wake him up. He later pointed out that, this being the case, I should rouse him from bed any time I want when at Disney since he'll cheer up once he's in the park. Though this sounds risky I'm totally taking advantage of that note next time we go. We finally got the bus timing right and were off to the Studios in short order. Upon arrival, they had a red carpet and performers out entertaining/interviewing the crowd, which was a nice touch. Our first stop was Rock 'n Roller Coaster for FastPass #1. Pat was incredibly disappointed to see that Steven Tyler's shocker hand gesture had indeed been digitally (no pun intended but I laughed when I realized) removed. We realized too late - just as we were getting off the ride - that for our ride photo we should've done the shocker in memorium. We vowed to correct this mistake later in the day if possible. 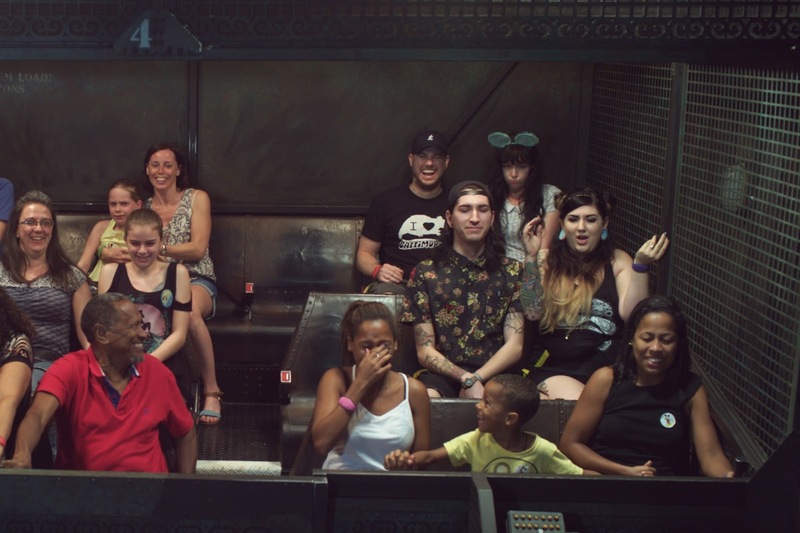 We poked around a few gift shops before backtracking to Sunset for our Tower of Terror FP+, which I booked purely because I love my boyfriend. ToT and I have had... OUR UPS AND DOWNS (pun 100% intended and I laughed immediately). 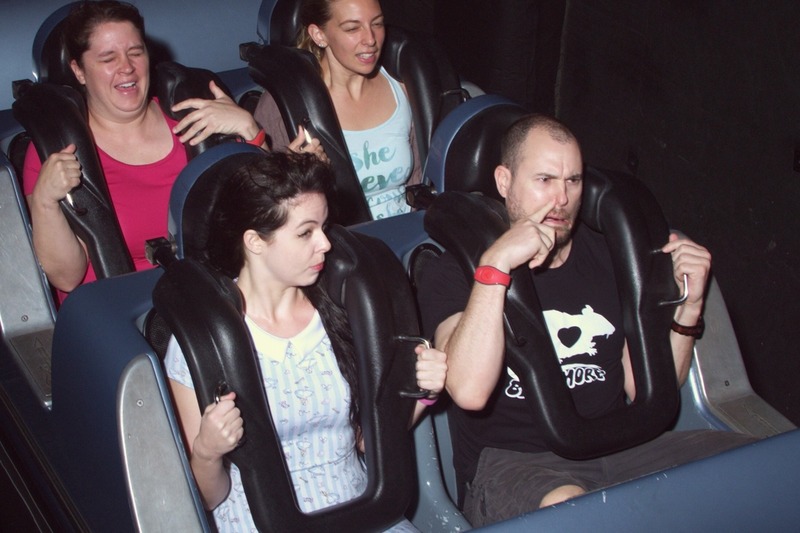 This is to say that while once the ride starts I enjoy myself, the anticipation freaks me out. 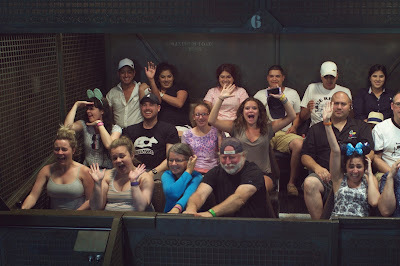 But I survived my trip to the Twilight Zone. It felt like snack time, so we followed some free-range stormtroopers ("DO YOU HAVE YOUR IDENTIFICATION????" they said to the Spanish-speaking toddler, who was all ????) back to Sweet Spells where we picked up one of those "Minnie's Bake Shop" soft bake cookies that are kind of amazing. You know, that you can also get packaged but they're still inexplicably good? I'm not 100% sure about this but we MAY have caught some of the March AGAIN while we ate our cookie. I wouldn't be surprised. We caught a small bit of the Jedi Training kid thing before taking advantage of our Star Tours FastPass. I was very disappointed to get the pod race AND Boba Fett, because those are the segments I somehow ALWAYS get, but I was pleased by the BB-8 interstitial. Also C3PO called some podracers "ruffians" and I have a cat named Ruffian, so. "My cowboy friend's house burned down. It's sad, but I did warn him. I said: don't you know you can't build your home on the range?" And then they drove off in a tiny car. The Disney difference! Yes, my friends, we rope-dropped a restaurant: we were one of a small parade that marched into the Brown Derby Lounge at precisely noon. I'll save a full review for a later post, but suffice to say it was pretty awesome. Also we saw the Star Wars shows like 87 times. Pat would love to recite all of Captain Phasma's March of the First Order lines for you if you're interested. While eating I had managed to snag another RnR FastPass, but we still had some time to kill before it opened. Once again proving my love, I agreed to do Tower of Terror again on standby with a posted wait of 30 minutes. I'd say we were in the library after about 25. I survived, even! 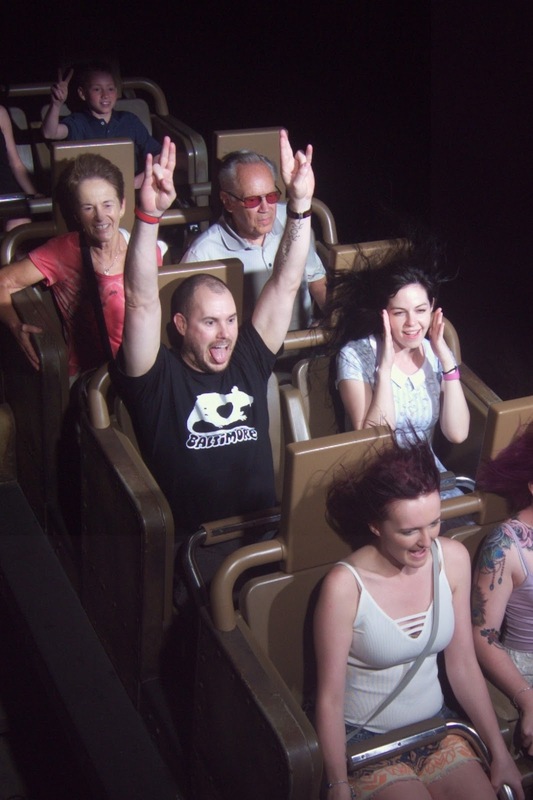 From there we cashed in on our RnR FastPass, where "Sweet Emotion" played as we threw up twin shockers for the photo. We were delighted to see it didn't get censored in the photo display area - but it somehow disappeared in our photo package! :( I don't think the photos got flagged, either, because we had some mysterious strangers' photos instead. Same thing happened during our first Splash Mountain go-round. Bummer. 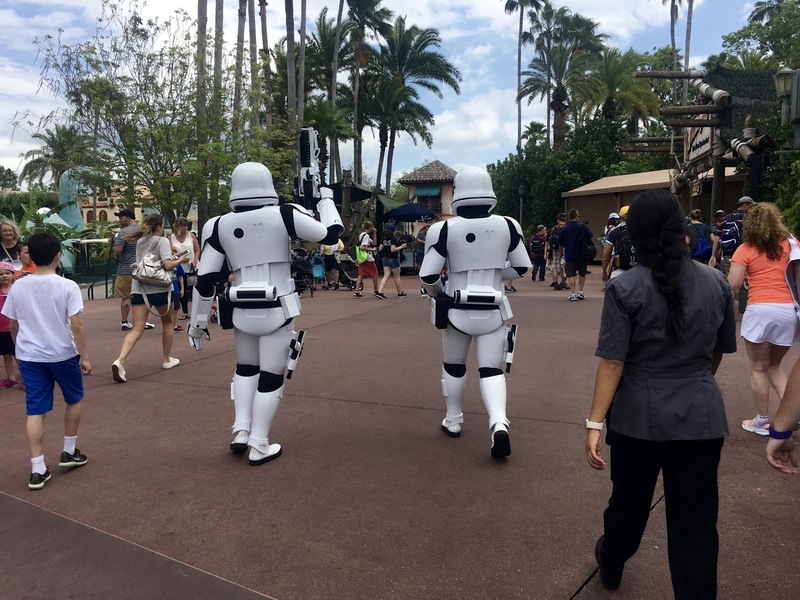 This closed out our Studios plans, so we exited the park accompanied by the sweet, sweet sound of the March of the First Order. 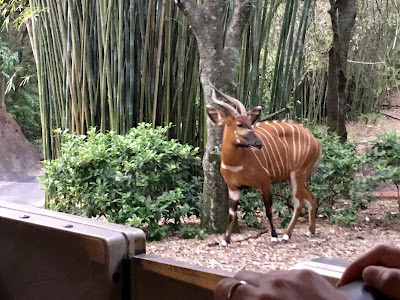 Over to Disney's Animal Kingdom, my Very Favorite Park! 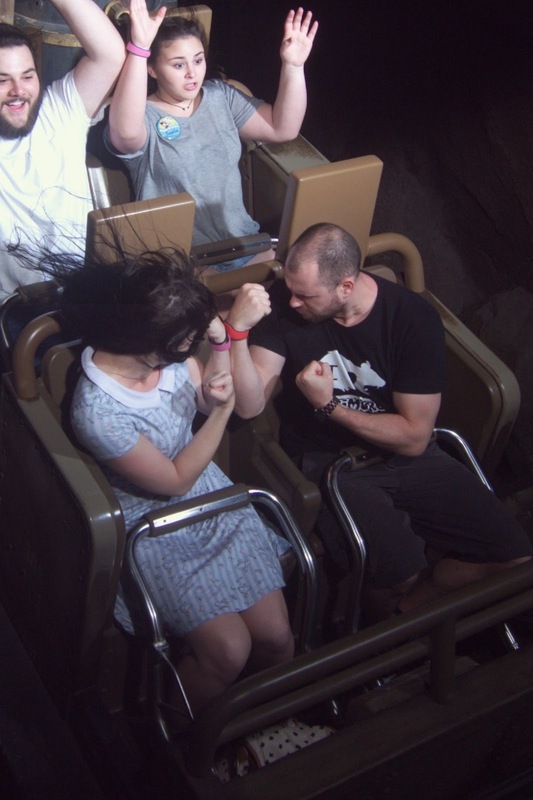 I snagged an Everest FastPass on the bus, so we did that first. 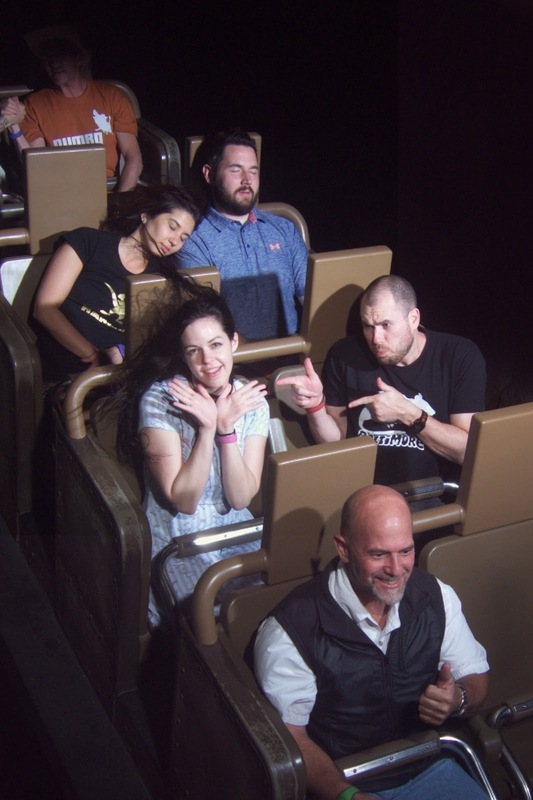 Three times, based on the PhotoPass evidence. We rode it so many times I don't even remember all of it. NEVER ENOUGH EVEREST! 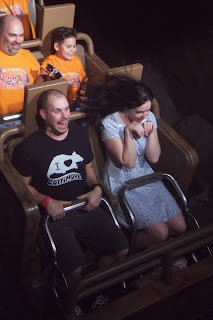 Then I dragged Pat over to what might be my Very Favorite Place in my Very Favorite Park: Harambe! Before I go any further, I must be the bearer of bad tidings: my friends, Kusafiri's paw print brownie is no longer a thing. It does not exist. Pat was quite devastated. I, too, suffer. Ah well; couldn't be helped. Instead we scooted over to Dawa Bar for some cheering drinks. While there, I made an instant friend! A girl came up to me and correctly identified my Alice dress as being from Hot Topic. We had a mini-Hot Topic amazing-Disney-stuff love fest and it was awesome. Seriously, guys. Get on this. I insisted on staying for a Burudika show (THIS IS ALL YOUR FAULT, ESTELLE), but was able to tear myself away-post performance for a recently acquired Dinosaur FP. Honestly, we didn't really need it. For some reason people were leaving the park in droves. I don't know if everyone's just trained to leave at 5pm even though hours have been extended, or they're waiting for Pandora, or what, but there was a mass exodus as early as probably 4pm. Weird. Indeed, we so little needed our FP that when the FP lined got blocked by a massive group of slow-moving individuals led by the world's most cautious ECV driver, we hopped the rope into the regular line and still walked right into the briefing room. 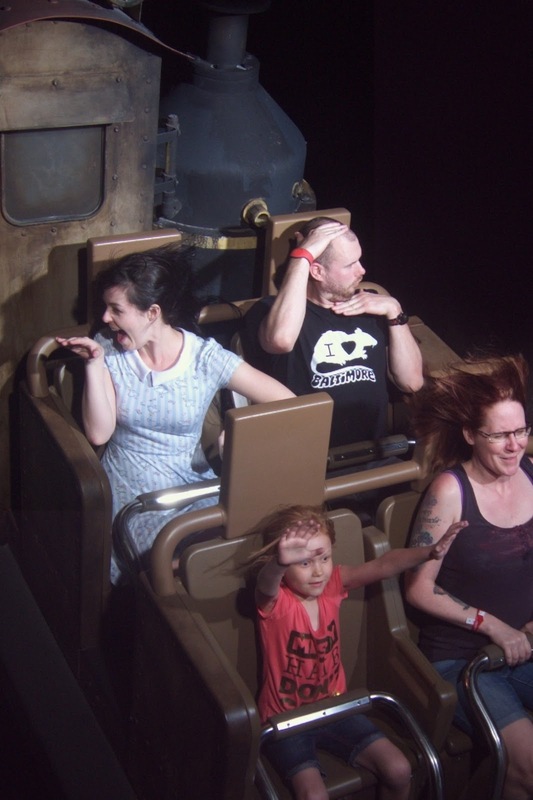 Then I rode Dinosaur tipsy. HIGHLY RECOMMENDED. On the way out we picked up a shirt for Pat's niece, who has recently discovered what we all know: dinosaurs are awesome. 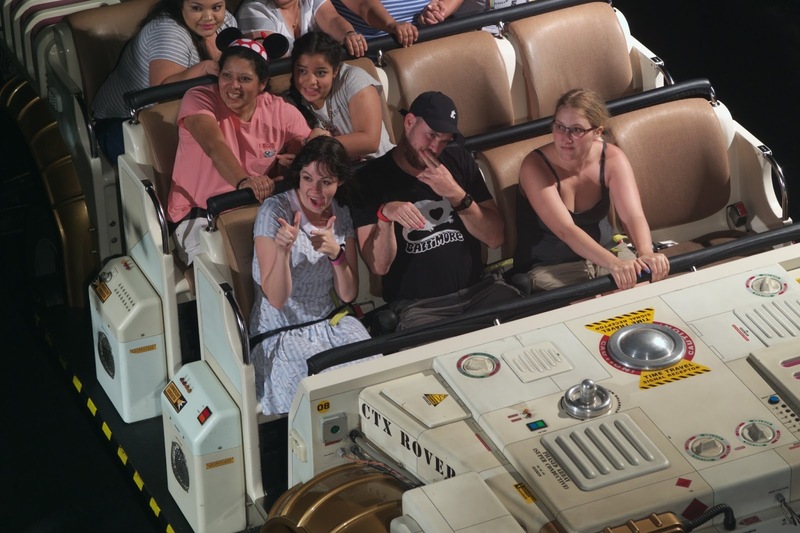 While purchasing I had a lovely chat with a CM who agreed that DAK definitely is the best park, and prompted me to perform the Wilderness Explorer's Salute or whatever the hell it is. Drunk me is a chatter. A quick scroll through the MDE app showed wait times were plummeting everywhere. 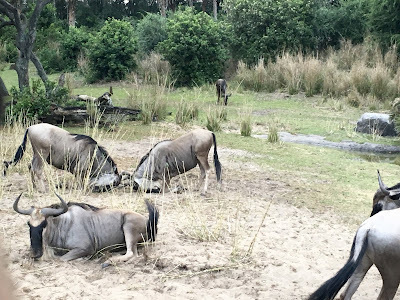 We ran over to Everest and enjoyed an almost wait-free ride, then shared Fireball shots at the Thirsty River bar before I hustled Pat back to one last Kilimanjaro safari trip on the theory that at this later time the animals may be more active. Which they kind of were? 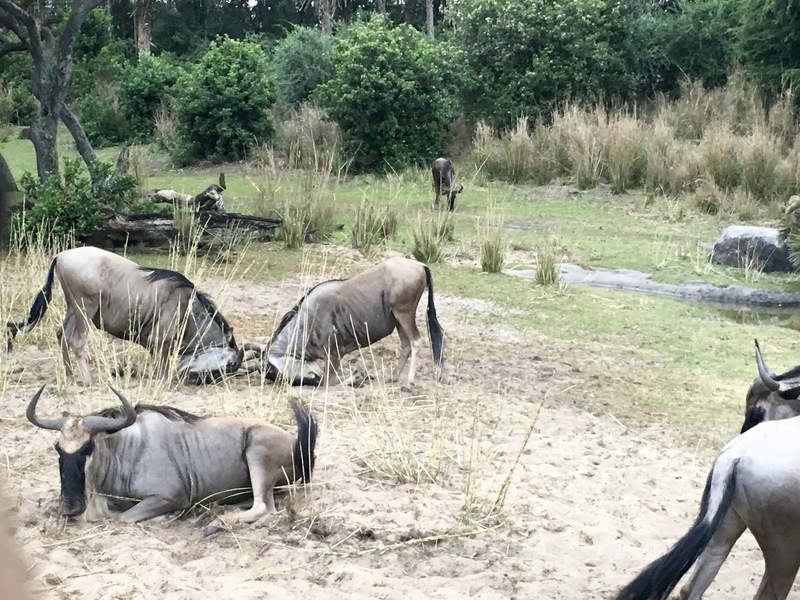 The wildebeest were holding it down, anyway. We waited maaaaybe 20 minutes, max. I had picked up one more Everest FP, just to be safe, so we headed back to Serka Zong. One more round of Fireball shots from Thirsty River and then we headed off on our Himalayan adventure in the setting sun. Pat wanted to have one more good, sit-down meal before we left, and some heated refreshing finally yielded a Boatwright's ADR for 9:15pm. Leaving the park was the smart move if we wanted to be on time... and we made it like 15 feet before turning around and zipping through Everest one more line-free time. Bonus: it was finally dark! I love Everest in the dark!! 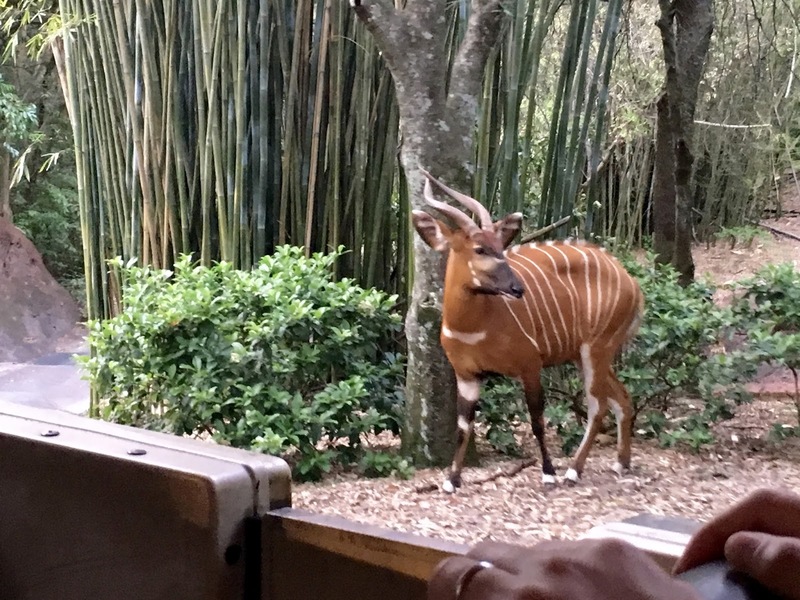 Then it was really time to go - Pat didn't want to stay for Rivers of Light and to be honest none of the reviews have made me crazy eager. Don't get me wrong, I want to see it, but I'm not worried about it; I'll catch it next time. I was sorry to walk by the dance party that was going down by the Tree of Life, but we had an ADR to make. We were able to pick up a bus back to Riverside pretty quickly, but just for safety I pushed our Boatwright's reservation back by 15 minutes. We went straight from the bus to the restaurant - more on this to come.